VANCOUVER — A ribbon cutting to commemorate the Mary Granger Sculpture Garden public art collection’s move to a new, more visible home at the downtown Vancouver Community Library (901 C. Street) will be held on Fri., Oct. 5 at 5 p.m.
“The Sculpture Garden at the downtown branch of the Fort Vancouver Regional Libraries represents the continuing efforts by the Community Foundation for Southwest Washington and the City of Vancouver to install works of art by regional artists that beautify public spaces,” said Vancouver Mayor Anne McEnerny-Ogle. Winged Woman was Elizabeth Heron’s second piece of commissioned public art. 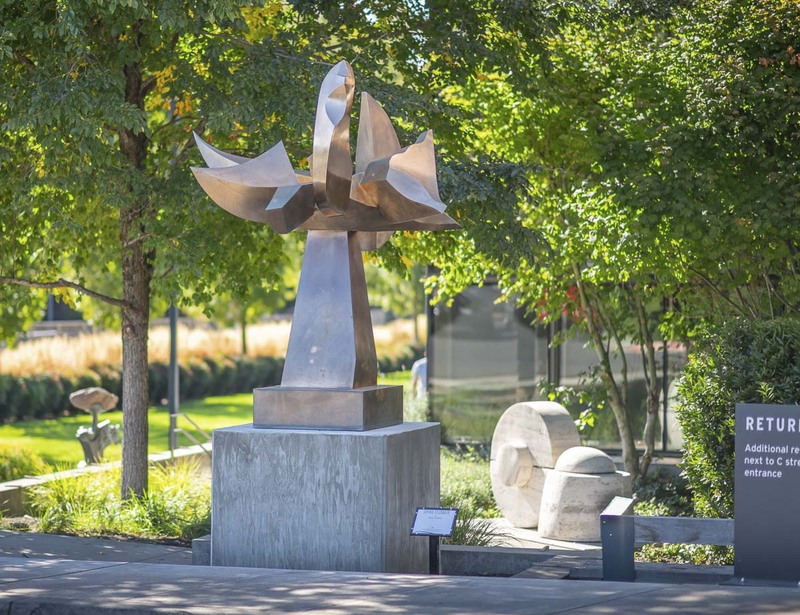 It was purchased for the Sculpture Garden by a private donor through the Community Foundation for Southwest Washington in 1997. “Winged Woman” was designed and cast in Ms. Heron’s studio. The sculpture is bronze, which Heron prefers for its historical aspect. Heron has degrees in art from Portland State University, and has taught art and welding in Vancouver. 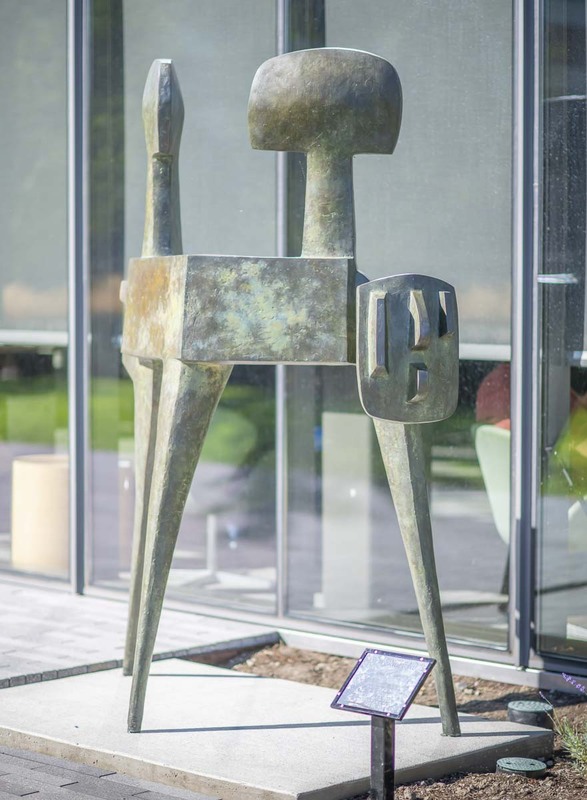 Early in her career, Heron was an assistant to James Lee Hansen, another artist with work in the Sculpture Garden. 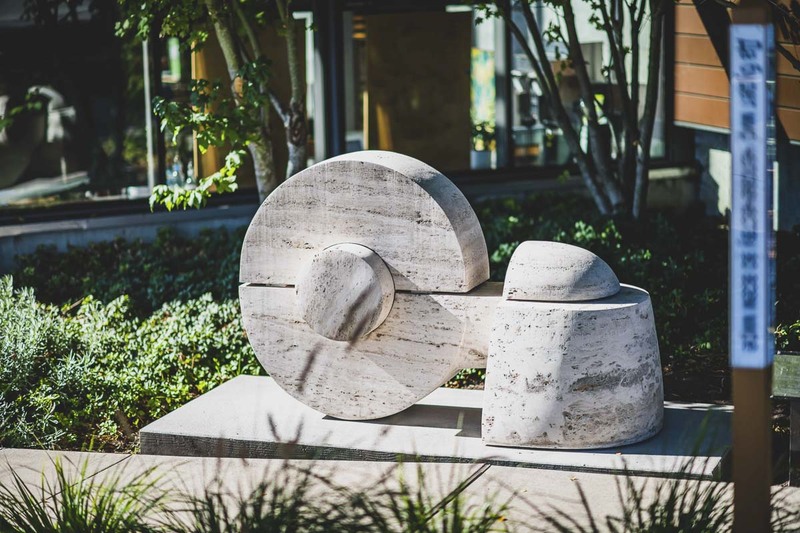 The Wheel Series by sculptor Don Wilson is an interlocking limestone piece. The five pieces of the sculpture each represent a different element of the community: people, government, business, schools and religion. The wheel element represents Vancouver’s forward movement, from a historic settlement to a modern-day city. Much of Wilson’s work was completed in the 1970s and is currently located in public spots across the Portland metro area, including the South Park Blocks, the downtown transit mall and the Portland State University campus, where he taught. Wilson was born in Ocean Park, Washington, in 1934. He died in Portland, Oregon, in 2007. Glyph Singer No. 3 is a bronze sculpture, cast in 1976 as part of James Lee Hansen’s “Ritual” series. Hansen’s career started in Vancouver in 1950, after he graduated from the Portland Art Museum School. He attended college on the GI Bill after serving in World War II. Hansen had the first bronze casting facility in Vancouver, which he built near the Burnt Bridge Creek where Highway 500 is now. Hansen currently lives and works in North Clark County. He was born in Tacoma and lived there until he moved to Clark County at age 11. He has been a lifelong resident of Clark County ever since. The Spike Flower was donated to the City in 1991 by the Community Foundation for Southwest Washington. Manuel Izquierdo was a sculptor and woodcut artist born in Madrid, Spain. His family fled after the Spanish Civil War in 1936, settling in Portland in 1942. He was first introduced to welding while working at the Kaiser Shipyards during World War II. He graduated from the Museum Art School (now known as the Pacific Northwest College of Art) in 1951, and taught there for nearly 50 years. 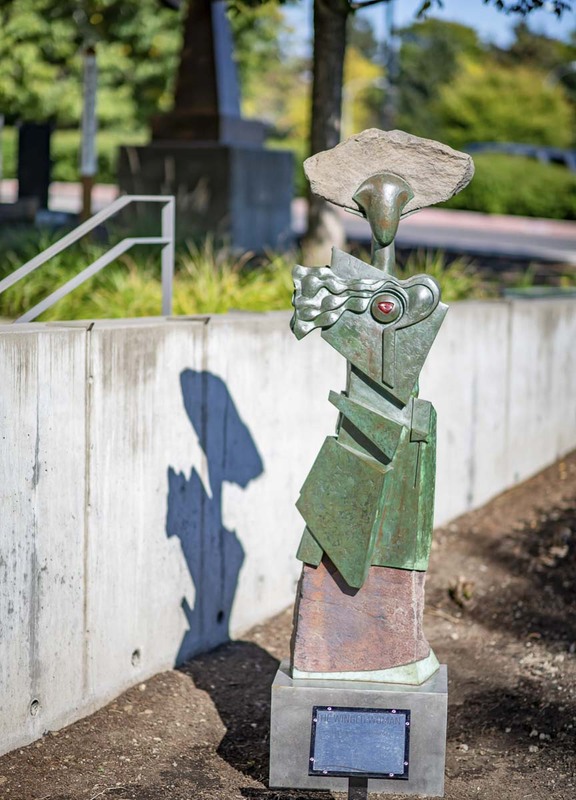 Izquierdo has several other sculptures installed in public places in the Portland metro area. In 1991, he received the Oregon Governor’s Arts Award. He died in Portland, Oregon, in 2009.